A Design Wall – At Long Last! I have a new design wall! 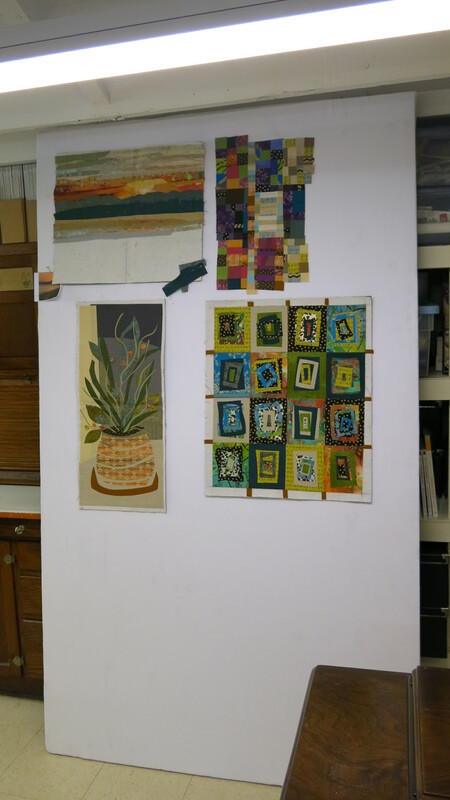 Here it is with some sample pieces I started in a Sue Benner composition workshop back in January. I decided that the best solution would be a portable design wall that could move as needed. I did some online research and saw many clever approaches from pull-down design walls to free-standing units that pop-up and can then be folded back into a storage bag. I decided a simple, very light weight, flannel-covered board would work well for me. 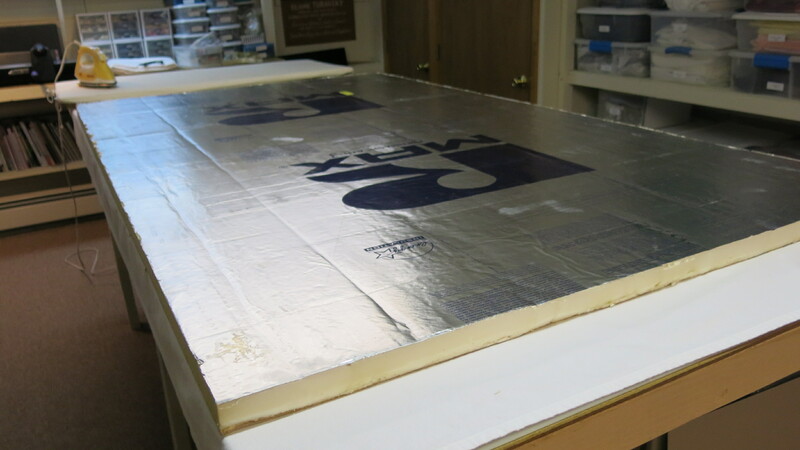 – With the help of a contractor friend, I started with a standard 4′ x 8′ size piece of 1 1/2″ thick insulation foam. (It helps to have a friend with a truck at this point unless your car is much bigger than mine.) Since the ceiling in my studio is not very high, I had to trim the board a bit so it would be just the right height to rest against the shelves and fit under the ceiling beams. It’s made of foam and is easy to cut with a straight edge and utility knife. – The board was centered onto the sheet. There is bold writing on the back of the board so make sure to put the plain side down so the lettering doesn’t show through the fabric on the front. 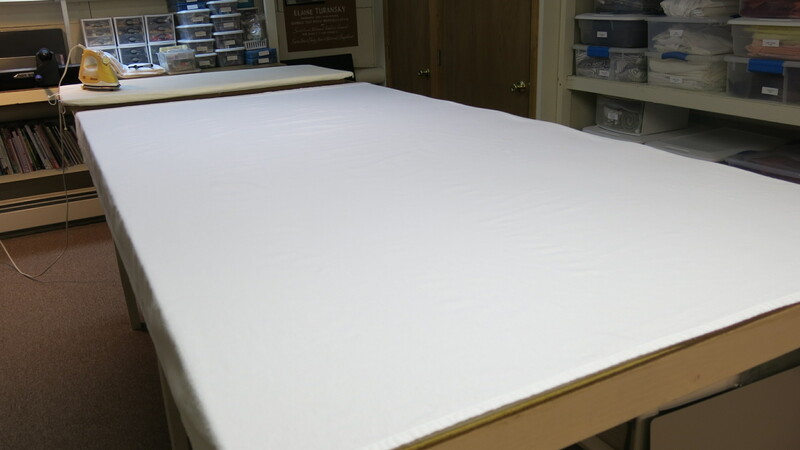 – I folded the top and back edges of the flannel over the board, using a little temporary adhesive to help me stretch and hold the fabric taut. Then I angled T-pins into the foam to hold the edges securely. 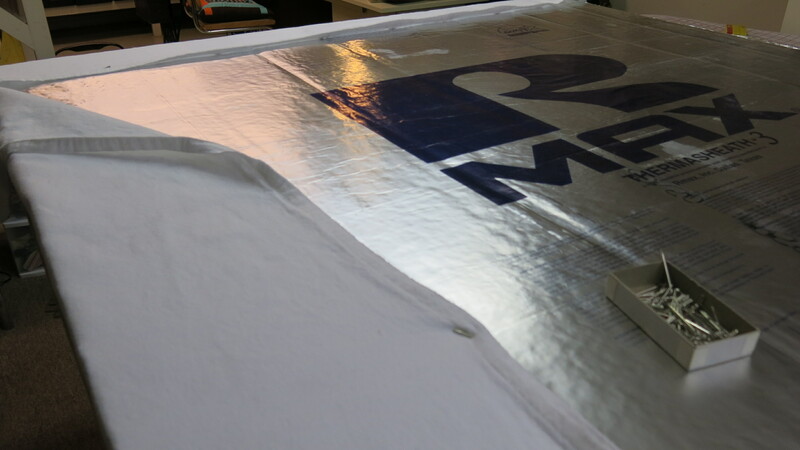 – Working from the center of each side, I folded and pinned the excess fabric at the sides to the back of the board. I tried to neatly miter the fabric at the corners but I wasn’t fussy. No one is going to be looking at the back. – I leaned the covered board against the shelves and it’s perfect…light weight yet sturdy, and I can easily move it off to the side to get anything I need on the shelves behind it. And should it get dirty or full of threads, I can quickly unpin the flannel, wash it and put it back on the board. I love my new design wall. It was so easy to make. Now to the fun part….designing! This entry was posted in Quilting, Sewing, Studio Space and tagged design wall by Elaine Schmidt. Bookmark the permalink. I had the same space issue and my darling husband made me a light weight portable design wall. It is well loved and very well used. It is so easy to make and one of the best quilting tools ever. I can already see it’s a necessary tool that will be in constant use. Just took a quick peak at your blog, Cath. Love all your colors! Gotta go back and look at your posts. Great idea Elaine…..I am in the process of setting up my sewing room ( moving it out of the studio, lol, just not enough room for everything….) and thought I would use ceiling tiles attached to one of my walls, as I will be able to have a free wall in the new room….love how you made it work for your space! Thanks, Ann. Good luck setting up your sewing room space. Put some photos out when it is done. 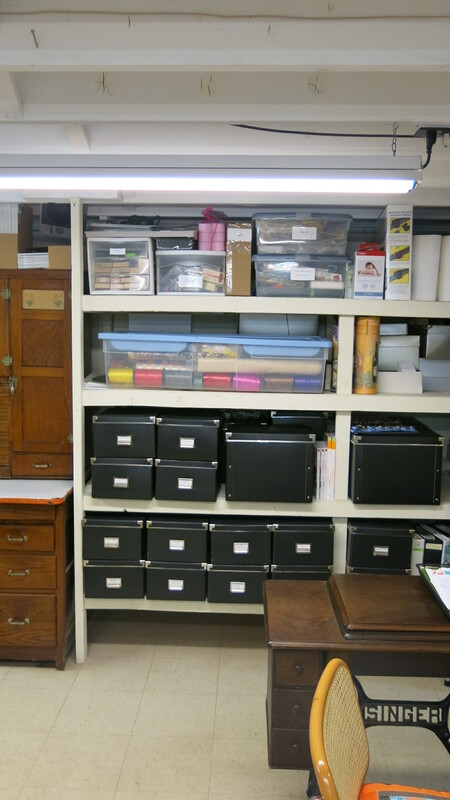 Isn’t it amazing how our need for studio space continues to grow.